Ammonia poisoning is one of the biggest killers of aquarium fish and occurs most often during the setup of a new tank. It can also occur in an established tank when too many fish are added at one time, when a filter fails due to power or mechanical failure, or if bacterial colonies die off due to the use of medications or a sudden change in water conditions. Elevated ammonia can't be seen, making regular monitoring a must so that it's not missed. Frequent water testing can detect levels of unionized ammonia (NH3) long before it turns into the invisible fish killer. Ammonia poisoning happens when a fish tank's ph levels become elevated, offsetting the nitrogen cycle. In ideal water conditions, ammonia levels should be nonexistent. However, tap water and the decomposition of organic matter inside the tank can both contribute to this condition. Even the smallest amount of ammonia can cause gill damage in fish and extremely high levels are oftentimes fatal. Ammonia poisoning can happen suddenly or over a period of days. Initially, the fish might appear to be gasping at the surface for air. Their gills will take on a red or lilac color, making them look like they're bleeding. Your fish will start losing their appetites, as their bodily functions fail, and they will become increasingly lethargic. In some cases, you might find fish laying at the bottom of the tank with clamped fins. As the damage from ammonia poisoning continues, the fish's tissues begin to deteriorate, evidenced by red streaks or bloody patches on their body and fins. Ammonia poisoning will eventually cause damage to the brain, organs, and the central nervous system. You'll see the fish begin to hemorrhage, both internally and externally. Then, they eventually die. Ammonia can enter the tank through a number of different ways. The first way is through chemically treated tap water. Some water treatment companies use a chemical called chloramine—chlorine bonded to ammonia—as a more stable disinfectant for city water systems. Using tap water that's been treated with this chemical is a recipe to aquarium disaster. The decomposition of organic matter—aquarim plants, fish excrement, and uneaten fish food—is another way ammonia levels rise in tanks. Overfeeding and lack of cleaning add to a buildup of the bacteria that feed on this superfluous matter, resulting in an ammonia byproduct. (So, clean your tank regularly!) Fish, themselves, also contribute to rising ammonia levels in tanks. When a fish eats food, the protein-building process that ensues (in order for them to grow larger) can produce a byproduct that enters their blood. This results in the seepage of ammonia through their gills and into the tank. If the ammonia level in your tank rise above 1 ppm (part per million) on a standard test kit, begin treatment immediately. Lowering the pH of the water will provide immediate relief, as will a 50 percent water change (be sure the water added is the same temperature as the aquarium). Several water changes within a short period of time may be required to drop the ammonia below 1 ppm. If the fish appear to be severely distressed, use a chemical pH control product to neutralize the ammonia. At this point, restrict feedings so that additional waste is reduced. In cases of very high ammonia levels, feedings need to be discontinued for several days. And obviously, no new fish should be added to​ the tank until both the ammonia and nitrite levels have fallen to zero. When you start a new aquarium, ask a friend with a healthy, well-established aquarium for a cup of gravel from deep off the bottom of his aquarium. Yes, this looks very dirty, but it is full of anaerobic bacteria that helps complete the nitrogen cycle, keeping both ammonia levels and nitrates at bay. Place one small cup of this unwashed matter into the very bottom of your new aquarium, cover it with at least 2 inches of new aquarium gravel, and fill it with aged water. The "good bacteria" contained in the gravel will help the nitrogen cycle complete itself in a new tank in less than three weeks (as opposed to three or four months the traditional way). This cuts down on the number of toxic byproducts present in the water. That said, when starting a new tank, add only a couple of fish initially and do not add more until the tank has completely cycled. 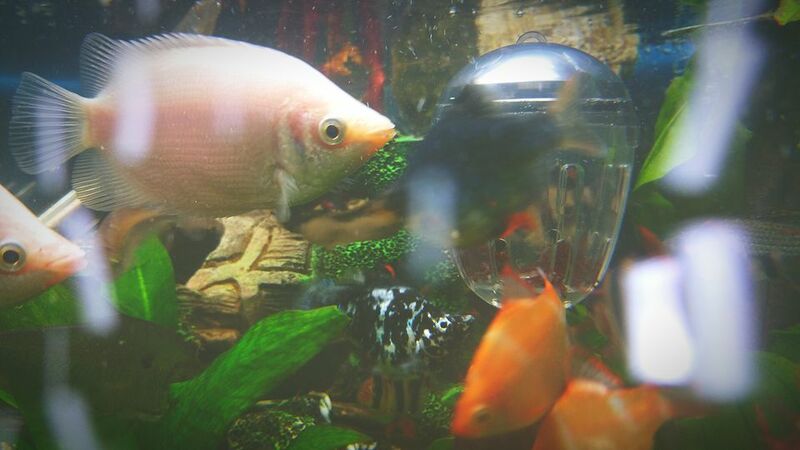 Even in a well-established tank, you should only add a couple of new fish at a time to avoid overstocking. Another way to avoid ammonia poisoning is to feed fish small quantities of food, and then remove any food not consumed within five minutes. Also, clean the tank weekly, taking care to remove dead plants or other debris. Perform a partial water change at least every other week (more often in small, heavily-stocked tanks). And test the water for ammonia at least twice a month to detect problems before they become serious.